The IBM® Storage Networking SAN512B-6 and SAN256B-6 directors with Fabric Vision technology combine innovative hardware, software and built-in instrumentation to ensure high levels of operational stability and redefine application performance. Fabric Vision technology enhances visibility into the health of storage environments, delivering greater control and insight to quickly identify problems and achieve critical service level agreements (SLAs). The modular building block increases scalability to accommodate growth for large-scale enterprise infrastructures. Increase performance and support high-density, high-performance server virtualization, cloud architecture and flash with 32 Gbps port speeds and up to 1 billion IOPS, based on IBM internal testing. 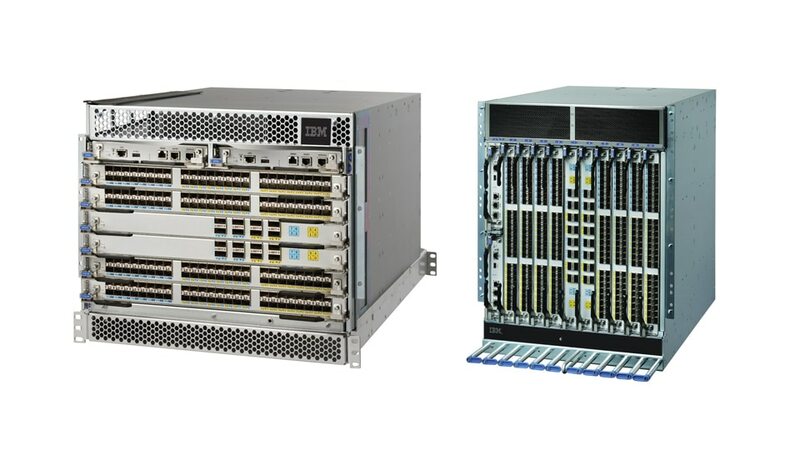 Consolidate infrastructure with high-density solutions built with 128 Gbps UltraScale Inter-Chassis Links (ICL) connectivity for simpler, flatter, low-latency fabrics without using any device ports. Simplify end-to-end management of large-scale environments by automating monitoring and diagnostics. Seamlessly integrate next-generation flash based on non-volatile memory express (NVMe) flash with current and future b-type Gen 6 Fibre Channel networks and mitigate risk with backward compatibility. Simplify configuration automation and enable integrated advanced services across the fabric with standard Representational State Transfer (REST) application programming interfaces (APIs).